A walk through the Marches of England, with extensive forests, limestone tops and gentle pastures in an area dominated in mediaeval times by the Mortimer family, one of the most powerful Norman earldoms. It follows a succession of hills and ridges with some strenuous climbs, crossing the valleys of the rivers Teme, Lugg and Arrow, taking in the Mary Knoll Valley, the High Vinnals, Orleton Common, Croft Ambrey and Wapley hill fort and visits a number of villages. 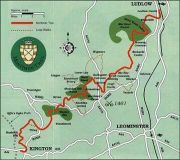 The Trail starts in Ludlow, Shropshire, but soon enters Herefordshire.